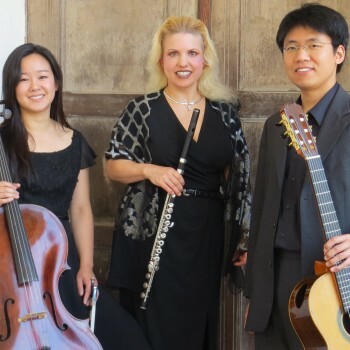 Hill Guitar Company will be sponsoring the third concert of the Santa Cruz Chamber Players Concert Series! There was a flowering of trios written for violin, cello, and guitar during the late eighteenth and early nineteenth centuries. Mozart’s Grand Trio in E minor expresses his mood of heartfelt longing over his mother’s recent death. Paganini’s Terzetto shows the brilliance typical in his violin writing, and when performed on the flute instead of the violin, these works create the foundation for modern compositions written for flute, cello, and guitar. Nathan Kolosko’sHungarian Trio is a celebration of traditional Hungarian folk melodies and dances, using compositional techniques that mimic the Hungarian shepherds’ flute, ütőgardon, and cobza. “Life is so delicate,” says Chinary Ung, and his Luminous Spirals, a highly spiritual and contemplative work, reflects this sentiment. It was Ung’s first composition after he emerged from a decade-long hiatus from almost all writing in order to aid his fellow Cambodian countrymen. Buy tickets now, you won't want to miss this!